Posted by Jonny Greenwood on 11/22/2018 2:16:53 PM. I bet most of you will like the second image and want to make your bookshelf beautiful and tidy like the image above. 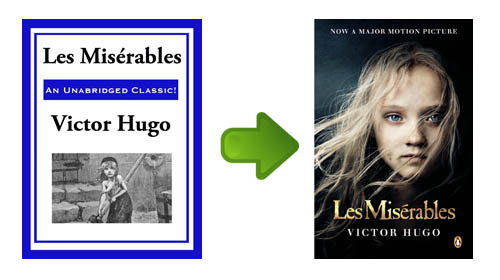 And this post is going to tell you how to change Kindle book cover. 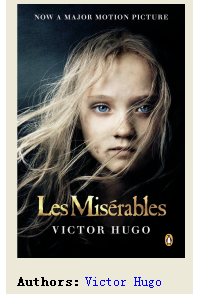 For example, I purchased the book Les Miserables in Kindle store but the cover is far away from beautiful, then I find another cover by search in Google, so I want to replace the default cover with the image I like. Download the tool here: http://calibre-ebook.com, which is free to use. Find the DRM-free book decrpyted by Kindle DRM Removal in the 2nd step, and drag it into Calibre's interface. Right click on the item name and choose "Edit metadata" --- "Edit metadata individually", then you can see the options for changing cover. Click "Browse" to choose the image you want to set as cover, then click "OK" to confirm this customization. By the way, you can also edit the book name, author name, genre, tag information as you want in the metadata edit screen. If everything goes well, click the item name you can see its cover image has been changed through the right meta-info sidebar as the image shows. You may be confused by this step. What's the point of converting mobi to mobi? Because if you only edit the metadata and click OK, the customized metadata is not written into your book, instead it's just saved in Calibre's local library. To make sure the customization goes into effect, you need to convert the mobi book to mobi to write the new metadata into the book itself, not just in Calibre's local library. Click "Click to open" format in the right sidebar after the conversion finishes, you will see the newly converted mobi book, while the original mobi book's extension name will become ".original_mobi". Transfer the newly converted mobi book to your Kindle, if you don't know how to do it, here is the guide about 3 ways to transfer books to Kindle. As you see, It displays perfectly on Kindle Fire. Q: The cover doesn't show up in my Kindle for PC/Mac. A: Yes, that's normal, but as long as you follow this guide, the cover will displays well on your Kindle device and app. Q: The new cover is blurry on my Kindle. A: Please choose a high-definition image as the new cover. Q: The cover remains default on my Kindle. A: Please make sure you were transferring the correct mobi file into your Kindle. How to check? Double click the item name to read it via Calibre, flip to the first page to check the cover image. Thanks very much for trying this, I have followed all the steps on this page, and my book's ugly cover has now been removed, (yay!) but it's now just a default text cover, not my nice new downloaded one? Any ideas where I'm going wrong? I did have a weird problem that when I opened the file in calibre it was already showing the nice cover I wanted before I even changed it! But I changed it anyway to be extra safe, and converted back to mobi. Can you please contact me via email [epubor.fors@gmail.com] and send the book file to me, then I can check out what is happening on your book. I had good luck with covers showing in Kindle for PC by changing a setting in Calibre. I tried a Mobi to Mobi conversion and it did not work so I did Mobi to Epub back to Mobi and it works! I'm having the same problem that Lisa is having. Thanks for the advice, but I just have the default cover for some files now! Is there any advice on that? Hank is right. I found this in FAQ in Calibre. The covers for my MOBI files have stopped showing up in Kindle for PC/Kindle for Android/iPad etc.? This is caused by a bug in the Amazon software. You can work around it by going to Preferences-&gt;Output Options-&gt;MOBI output and setting the “Enable sharing of book content” option. If you are reconverting a previously converted book, you will also have to enable the option in the conversion dialog for that individual book (as per book conversion settings are saved and take precedence). Will this work for Kindle Paperwhite books too? Followed Hank's directions to convert it to EPUB, then back to MOBI and it worked. Thanks! I looked at and followed many suggestions / solutions on the internet (including from the Calibre site) and none of them worked. I followed Johnny's instructions and it worked to perfection. 1) Do a Google Image search and download the covers/thumbnails required. 6) Follow Johhny's instructions on transferring / syncing the newly created mobi. I can't even find the 'Output format' option anywhere! Tried searching the other items in the drop-down menus as well. Which software you are using? Calibre or Kindle DRM Removal? Went through all the steps and my book still has the generic "noncover". I am using a Kindle Paperwhite. Thank you so much! I've been stuck on this for the longest time, I was missing the 'convert mobi to mobi' step because it's so non-intuitive. Great guide!